Rinjani volcano dominating Lombok island next to Bali forms the second highest peak of the Indonesian volcanoes. It is famous for its beautiful 6 x 8.5 km wide, oval-shaped caldera which contains a 2.5x4.8 km wide lake (Segara Anak) reaching 230 m maximum depth. Two young cones were built inside the caldera in the eastern part of the caldera, Rombongan and Barujani cones, which is the site of all historic activity, known since 1847, and frequently active. Most eruptions are strombolian type and sometimes form lava flows. Rinjani is a famous and very rewarding trekking destination. According to new reports, a large number of hikers are currently trapped in the park, about 500 in the area of Segara Anakan and 60 in Batu Ceper. Part of the eruption column collapsed into pyroclastic flows that reached short distances around the cone (less than 1000 m runout length). The ash plume itself drifted quickly southwest, forcing a temporary closure of Lombok's international airport and some flight disruptions (cancellations), in particular on the popular routes between Australia and Bali. Rinjani volcano Volcanic Ash Advisory: VA ERUPITON TO FL200 MOV W.
The attached picture by Rindi Rmaniar on Instagram taken from a few kilometers distance only shows the power of the vulcanian-type explosion: it generated an eruption column several kilometers high, sent ballistic projectiles and pyroclastic flows by collapsing parts of the ash column covering all the slopes of the Baru Jari cone which grew significantly last year. Lombok's Praya Airport was closed today from 16:55 and is expected to reopen tomorrow morning at 10:00 am. It seems likely that the ash plume, which appears not particularly dense and smaller than originally reported by Darwin VAAC, was the result of a sudden explosive event (perhaps phreatic) of the volcano whose last eruption was last year between Oct-Dec. Other causes of the ash plume are possible, too, e.g. a major collapse event inside the caldera. More details will be added as they come in. Impressively, the lake temperature has risen so much that large parts of the surface are steaming. The volcanic activity has been producing only smaller ash plumes during the past days, which did no longer affect air traffic to / from Lombok and Rinjani. This apparent change in eruptive style could be due to a decreasing phreatomagmatic component (water mixing with magma) in the eruption. According to local press, the explosions from the vent reach heights of (only) 50 meters and Gede Suantika, head of the Center for Volcanology and Geological Hazard Mitigation, who is also quoted to say that the eruption is likely to last 3 if not 6 months. On the other hand, in a report from a few days ago, strombolian explosions were mentioned to reach 750 m height. The ash plume has been reduced to lengths of approx. 100-150 km and more southerly winds have pushed it towards the NW this morning, allowing the international airport of Lombok to reopen today. Some Australian airlines have been adding extra flights to Bali to help the many stranded travelers return home. On this morning's satellite image, the ash plume can be seen hovering in N-S direction across Lombok island, while Bali was free of ash. However, easterly winds are likely to pick up again soon, which could cause significant flight disruptions again. 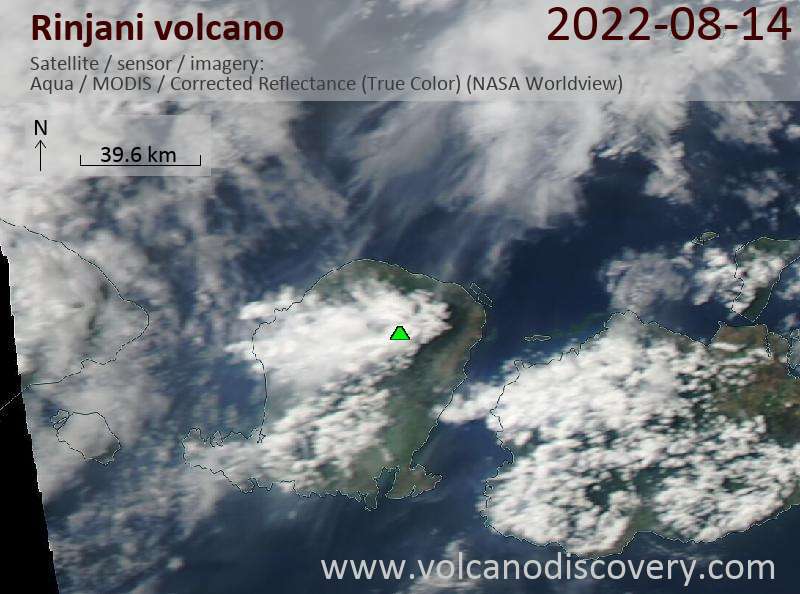 This current more intense phase of the eruption seems ot have started in the early afternoon of 2 Nov, when ash emissions became large enough to produce a plume that drifted westwards and reached Bali, where the airport of Denpasar was shut down. The plume was almost 400 km long this morning and the shut-down of the airport has been causing significant flight disruptions. When it can be reopened will depend on whether ash emissions continue and the prevailing wind direction in the coming days. On Lombok island itself, the rumblings from the eruptions are heard in many areas. Access to the summit area of Rinjani has been closed and a 3 km exclusion zone around the caldera rim is in place. Several villages on Lombok reported ash falls. The activity that had started a week ago continues. Explosions continue to produce small ash plumes from vents on the upper flank of the Barujari cinder cone inside the volcano's caldera. Hikers from and near the camp at the lake were evacuated and all trekking routes through the Rinjani National Park were closed, including those through Sembulan and Timbanuh, East Lombok, and Senaru and North Lombok. Rinjani volcano erupted again on Saturday and Sunday (22-23 May, 2010), sending ash to up to 2 km height and causing ash falls in surrounding villages. 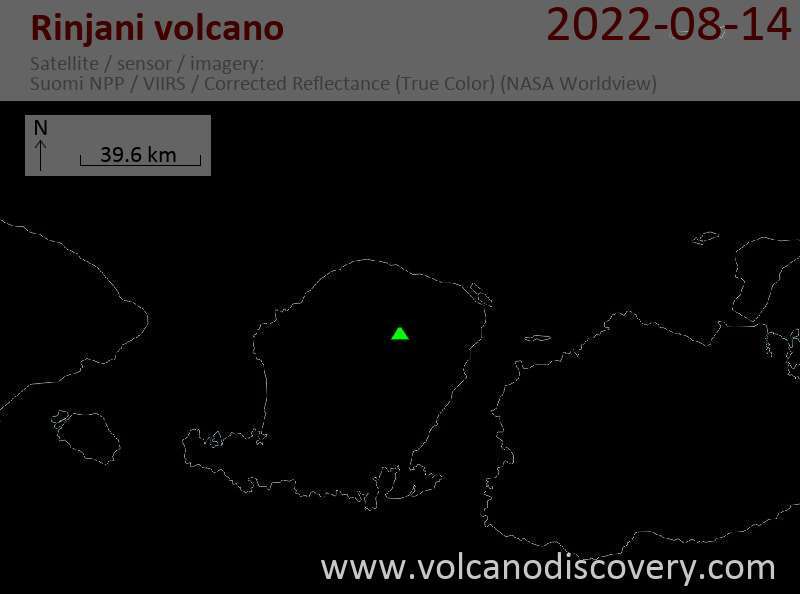 New reports mention lava flows from the active Baru Jari cone inside the Rinjani caldera into the lake. No fatalities or major damage were reported.